Freshman pitches KCKCC to softball split at Coffeyville – Welcome to Wyandotte Daily! 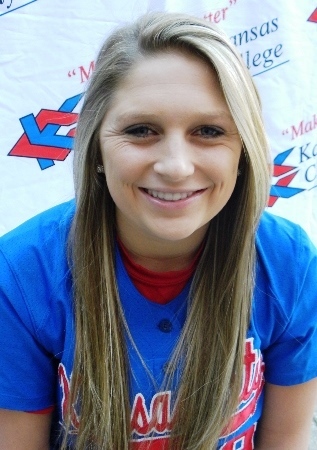 Kansas City Kansas Community College rode Leslie Ford’s strong pitching and hitting to a 3-2 win at Coffeyville Tuesday but had to settle for a split when Coffeyville rallied for a 4-3 win in the nightcap. The split left the Lady Blue Devils 3-1 in the Jayhawk Conference and 5-1 overall heading into doubleheaders at Hesston Friday and Hutchinson Saturday. A freshman from Garden City, Ford scattered six hits, struck out 12 and drove in the game-winning run in the 3-2 win. She was backed by an 11-hit attack that included two singles and a triple by leadoff hitter Lacey Santiago and a double and single each by Ford and Justice Scales. Trailing 1-0 in the fifth, the Blue Devils took the lead on five straight singles by Ford, Megan Dike, Santiago, Scales and Mierra Morisette. Coffeyville tied it in the bottom of the inning before KCKCC scored the decisive go-ahead run on a one-out single by Ashley Henigton and Ford’s RBI double to center. Coffeyville threatened in the bottom of the sixth with a leadoff double but Ford escaped with a pair of strikeouts and a popup and set down the Red Ravens in order in the seventh. The Blue Devils took a 3-0 lead in the first inning of the nightcap. After a leadoff single by Santiago, Scales tripled and scored on Morisette’s single. A double by Hanna Barnhart and a single for Ford added the third run. Santiago and Scales each had a pair of hits in the 9-hit attack but the Blue Devils managed on four more base-runners the rest of the way. Elizabeth Seimear took the loss despite allowing only six hits and two earned runs. She struck out four and walked one. After tying the game with two unearned runs in the second, Coffeyville won it on a two-out single in the fifth.